The world of home automation is changing and converging. As the IoT is increasingly being used for smart home use cases and there has been quite some – increasing – hype around all sorts of smart home labelled products and future home scenarios, the concept of the real connected smart home is more popular than ever. Yet, as always beyond hype there is also a reality. In this article we don’t look at the avalanche of consumer electronics products that have been launched at tradeshows such as CES nor at what a smart home could like in a decade from now but at smart home and home automation realities and evolutions as they are out there, will soon be out there or have been out there since quite some time. In fact, home automation, an essential part of a smart home, and even the concept and reality of a smart or intelligent home as such go back to long before the term Internet of Things was even coined. To illustrate this fact let’s look at some of the existing standards, technologies, functions and realities in two different areas, home automation with its increasingly importance of ‘smaller’ building management systems and small building automation on one hand and the smart home ‘segment’ as it’s often understood in the sense of connected appliances, remote controls and, today, IoT-enabled appliances at home on the other hand. Two separate, yet converging worlds as we’ll see. Standards and protocols which are used in a small residential building automation, home automation and lighting and room control context such as KNX, C-BUS or DALI bus technologies and wireless EnOcean exist since a long time as well, in many cases far over a decade. Even Z-Wave, a name that will probably ring a bell with people who are familiar with IoT is over a decade old. And of course everything is IP nowadays as light and room control (L&RC) and building management system (BMS) expert Jean Commeignes, who is responsible for the L&RC badge of the EcoXpert certification program of Schneider Electric, explains in our interview on the evolutions of light and room control amid the accelerating use of IoT. You can even go way back further in time to the seventies when the X10 home automation communication protocol was launched and enabled remote control of, among others, lamps. It was joined in the eighties by platforms/protocols such as LonWorks and CEBus (not the same as C-Bus). You will find some of the many mentioned standards in the high-end segment of the home automation world, for instance with regards to that aspect of light and room control which is part of the smart home automation ecosystem. You might also find them in a smart building automation system for buildings that are larger than the average home as this building automation example shows. You might even find them in even larger buildings and in an Industry 4.0 context as well, albeit it integrated with other standards. There are overlaps and more standards out there which really are used in various contexts, including home automation – but not solely. By way of an example: as Jean Commeignes also eloquently explains in our interview on lighting and room control, the concept of a room – and thus the used technologies and standards – stretches beyond rooms in a smart home context and combines a range of room control functions which you can find at home, in a hotel lobby, in an office meeting room and, as you can imagine, also in rooms and similar spaces in any other environment: warehouses, factories, you name it. Just like home automation and its evolving protocols aren’t new, the ‘vision’ of a smart home as most people see it in this day and age of connected IoT devices, isn’t really new either. The example of the connected fridge and all it would be able to do goes back to the early days of the Internet. In fact, at the end of the nineties these kinds of connected appliances already existed, albeit in limited ways and not as they look now. More importantly, as we’ll see a smart home is not one with a bunch of IoT-enabled and connected kitchen and other appliances. And smart home automation is a different thing. However, the notion of the smart home has been broadening and gradually including appliances on top of longer existing home automation realities such as temperature control, blind control, energy management solutions and the mentioned lighting and room control to name a few. Over a decade ago the term smart house used to be quite popular. However, the meaning of a smart house wasn’t really defined. In this 2004 publication, for instance, you see the term smart house used as the combination of intelligent devices, embedded into the home environment, with a focus on health monitoring and older people or people with disabilities. Do note that the idea of remote health monitoring, an important IoT use case in healthcare, goes back some time as well. For the authors a smart house consisted of several building blocks, including of course a lot of sensors. Others spoke about the smart house and indeed sold smart house solutions in the sense of what you would call a smart home in an IoT context, with on top of that several home automation controls and functions as they exist today. So, once again overlaps. This was also the case for another term we have been using long before the smart home; the intelligent home. Synonyms indeed but with intelligent homes and intelligent buildings we were again more in that dimension of heating and air conditioning controls, audio and video and so forth. There was also a Danish company, LK (Lauritz Knudsen), that made a building automation system for the intelligent home, called IHC which stands for Intelligent House Concept and is/was sold as a smart house solution by partners and got acquired. A term that you also may encounters is the connected home. In 2017 research from Gartner on connected home solutions (more below), the firm defined connected home solutions as follows: “Connected home solutions consist of a set of devices and services that are connected to each other and to the internet and can automatically respond to preset rules, be remotely accessed and managed by mobile apps or a browser, and send alerts or messages to the user(s)”. That’s a nice one too. Yet, essentially it overlaps with the types of solutions in the more modern sense of the smart home as we covered it and which is converging with the home automation sense anyway. To cut a long story short: many terms for similar and/or overlapping concepts and quite a bit of history indeed. And then the modern consumer IoT smart home craze still had to come with all its appliances and platforms such as Nest and many many others….. Reality? If it’s called smart today, the Internet of Things is always there. Home automation and smart home are two different things, although they are often used interchangeably. Home automation does what it says: home automation enables to configure and automate how various devices inside and outside/nearby the home work together in an automated way in the context of a connected home. You can compare it with building automation in larger, often commercial, buildings. And, in a sense, a smart home automation system can be compared with an IoT-enabled building management system (BMS) for smaller buildings, although in most homes you won’t find those high-end BMS systems but more limited home automation systems whereby the functions and look and feel are different, depending on what functions are needed. Yet, in the world of building and home automation, which really brings together several specializations, not all is black or white – it rarely is in general. So, you might certainly encounter mini-systems for home automation that are pretty sophisticated and look more like an integrated small building management system. 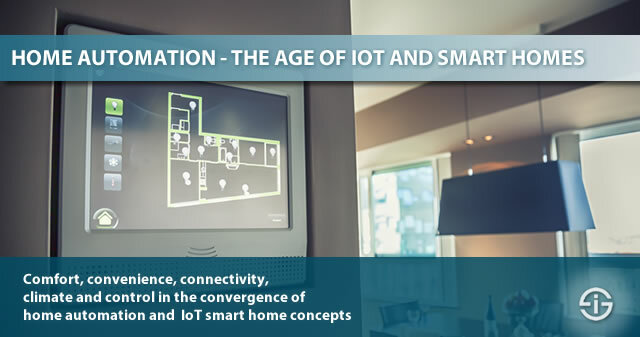 Thanks to home automation you can monitor and control the components in and nearby your home with the infrastructural foundations for a truly smart or connected home where smart electrical, mechanical and other operation technologies (OT) meet IT in IoT. What is the definition of a smart home, of which home automation is part, then? Is a smart home a smart building? Although everyone knows that a home is a building, a smart home is not a smart building. By way of an example that these two terms are distinguished from each other: in our overview of the main IoT investments per use case according to June 2017 data from IDC you’ll notice that a de facto distinction is made between smart buildings as a cross-industry IoT use case which is poised for fast growth ($40 billion in 2017 and, along with connected vehicles predicted to rank among the top segments until 2021) on one hand and the also fast growing investments ($63 billion by 2020) by consumers in smart home solutions on the other, with spending on smart home technologies forecasted to grow with a 19.8% CAGR until 2021. So, is that the difference between a smart home and smart building? Residential (private, home) versus non-residential? Unfortunately not always and it depends on whom you ask, it can get complicated indeed. Some will classify a large or even smaller residential multi-family building such as a big flat building or a smaller apartment building with the necessary connectivity, capabilities, intelligence and automation as a smart building. That is because such buildings have shared assets and facilities. Unless you’re really rich or disabled you probably don’t have a lift in your smart home, for instance. And if you do, it’s not shared, it’s yours. Some have found the answer by speaking about smart apartments in such a context of large residential buildings as it separates the ‘private living space’ which a home tends to be from the shared building space. Let’s make it even a bit more complex before making it easier and tangible again. Imagine airconditioning (AC). If you have it, it might be across your entire home or in one or more rooms. If you have it in your apartment, same scenario. If you live in a block of apartments one or more shared areas could also have it. However, it’s not hard to imagine that an HVAC (Heating, Ventilation And Airconditioning) solution doesn’t look the same in a room, building-wide in a luxury villa and in the possibly big entry hall – with the elevators – in a multi-family housing flat complex. Moreover, in the case of flats it uses shared resources such as the networks, electrical infrastructure and so forth, so with large residential buildings it’s a bit of a grey zone. Last but not least it’s important to remind that, although there are smart home and home automation experts, de facto often many worlds are colliding here. The people who know all about smart metering know electricity but that doesn’t mean they understand HVAC, which is an entirely different ball game or lighting and room control, which again is different. In most homes you won’t find the really high-end solutions though and home automation is different from your large luxury villa in the tropics. Moreover, the IoT is playing a converging role. In smart homes. And in smart buildings. On one hand smart home is an umbrella term for the automation, digitization and interconnecting of several home automation areas, which as mentioned have existed since quite some time: lighting, room control, blind control, solar shading, audio and video control, security and entry control, the list goes on. On the other hand and especially since the arrival of the Internet of Things and its many applications in the sphere of home appliances, smart meters and IoT consumer devices for the home such as smart TVs, connected entertainment systems, Internet-enabled appliances and voice-command systems, the smart home increasingly was seen as an integrated IoT-enabled living, security, comfort, entertainment and overall home concept which looks a bit different (no smart fridges in traditional home automation). Yet, as said, this too is converging. So, what would be the definition of a smart home in this context whereby we really move beyond single and often isolated ‘smart home solutions’ (and gadgets) to a somewhat broader perspective? A smart home is a house or other form of mainly one-family private buildings which is either home to the family, serves as vacation home or is rented to other families for living or holiday purposes, consisting of automated, digitized and connected home assets, electrical services, controls and appliances across several building and home components and functions. These run within a communications network and enable an enhanced monitoring, comfort, energy conservation, maintenance, home activities and security of its occupants whereby the residents/owners have access to the resulting services and controls via special displays and controllers, which can take many forms such as built-in wall displays, proprietary devices, remote controls, various IT devices such as a computer, tablet or smartphone and/or multiple devices at the same time. A smart home solution is a solution which plays a role in the realization of a smart home. However, the use of an intelligent device in the home or of one or more separate products or solutions which are labelled as smart home products or solutions by their vendors do not make a home a smart home. Integration and expansion possibilities are essential components of a smart home (more about the preferences regarding smart home solutions and ‘the state of the smart home’ below). We haven’t defined a smart building yet, that’s for another article. But by looking at some of the goals in smart buildings and building management, we can compare with the smart home. At the end of the day it’s more or less the same but with different types of buildings (mainly commercial and functional like schools, airports, hotels, factory plants, hospitals or office buildings but, as mentioned also and depending on whom you ask, large residential buildings), different technologies and application areas, different networks, other standards and solutions and goals of which some are also found in smart homes but which predominantly revolve around energy efficiency, building and occupant health, productivity and comfort of residents, asset maintenance, security, regulatory compliance and overall building health and value (as an asset to its owners). Regulation is a key driver in smart buildings (energy and ecology) but in some countries there is also regulation (and/or incentivization) with regards to modernizing older homes with an eye on energy consumption and even with regards to new homes. And saving on that bill is still important for families and the environment in general, regardless of type of building. The value of a building is important for whom owns it. Just as environmental certifications, modern technologies that make sense and the future readiness of a big commercial building makes it more valuable, the same goes for – truly – smart homes. And that doesn’t just go for the price of the building as such. If you ever wanted to rent a holiday home in a country like Spain for your vacation and you compared the price for a home with airconditioning (it indeed can be hot in Spain in the Summer), blind control and a connected home entertainment system with the price of a holiday home without airco and a good old satellite TV you know what we mean. Most of the other aspects in smart building (except perhaps the connected office and asset maintenance dimensions but you can easily translate those into private benefits too) are valid for smart homes as well. Comfort, for instance, needs no further explanation. As you can see it’s easy to speak about a smart home but less easy to understand what it exactly means. The latter is due to the explosion of all sorts of stand-alone IoT solutions and products that are sold under that ‘hot’ label of smart home but whereby the more holistic scope of smart homes and home automation is very often ignored. Again: a smart home solution does not make a smart home – and it’s not because a vendor sells something as being a smart home solution that it is but that’s another story. As mentioned smart home investments are poised to grow rapidly in an IoT context. There are already many smart homes with advanced home automation in specific markets, however. Remember that convergence of the traditional home automation and the smart home in the modern IoT context? Well, in luxury houses, among others, you will find smart homes with previously mentioned standards such as KNX, still one of the fastest growers in terms of smart home standards, also outside Europe and China. If we look at the more recent IoT-related meaning of the smart home, most ‘owners’ de facto have some smart solutions like a smart thermostat (and how smart is that, really?) , a smart entertainment system, a smart home security solution and of course a smart meter as governments and utilities roll out smart meter programs pretty much everywhere. But really few people have a fully smart and connected home. The full-fledged smart home is rarely a reality today. A true connected home would at the very least mean end-to-end interoperability and security, several of the above mentioned ‘applications’ such as HVAC, light control, room control, some form of energy consumption monitoring and control, the connection of smart home appliances and a more or less stabilized market, making that smart home vision come true. However, with the Internet of Things existing standards have been joined by several other standards and communication forms. Just think about the various evolutions in connectivity standards (short range like Bluetooth 5.0, Bluetooth Mesh, the next Wi-Fi and long range too for some applications), proprietary standards in the vendor ecosystems and platforms (the wars of the big players such as Google and Apple) and the different alliances with home automation standards (the previously mentioned Z-Wave, ZigBee etc.). If you look at the – longer existing – high-end of the smart home and home automation market there is obviously more maturity and these vendors have solutions that support several of the existing standards such as KNX, as well as IP. In home automation and building automation, a few standards will remain but IoT will replace a lot and act as a converging force. At the lower end and in the pure IoT smart home market it’s still a bit more of a disconnected mix. Moreover, that segment isn’t necessarily cheap either and there is a lot of DIY going on there, certainly in an IoT context (HVAC and electrical work, for instance for connected power, isn’t really fit for DYI and with DYI there are also DYI risks of course). Smart home solutions that cover it all are still far too expensive for most people as Beecham Research stated in its October 2016 smart home report. The research said that smart homes are overpriced but also undersold and misunderstood. Although the market of smart home devices is expected to do just fine, there is a lack of understanding of smart home solutions and what they can offer. This leads to the focus on practical applications and not enough on the aspects of new home comforts and easy living. At the end of 2016 there were ample announcements that will certainly further boost the IoT smart home space. There is more attention for security (e.g. the Z-Wave alliance launched a new certification program), there are innovations in connectivity (e.g., finally Bluetooth 5.0 is there, now the products), vendors have taken new initiatives (e.g. Google’s Android Things), the list goes on. However, the devices and solutions are still expensive, there is no open standard that is 100% safe to connect all the appliances and data. People also don’t trust the manufacturers and the suppliers enough and there is more fear than before. Despite all the factors that hold back growth in the market Beecham Research says that the sales of smart devices for the home will grow with an average of 34 percent to reach $16.2bn in 2020. The earlier mentioned research by Gartner, announced early March 2017, confirms that the connected or smart home in its true sense isn’t exactly for tomorrow (for everyone), although the period until 2021 will see strong growth in connected home and smart home solutions. According to Gartner’s research, a lack of understanding buyer motivations seems to play a crucial role in the reluctance of buyers and providers of connected home solutions are urged to better understand what inspires users to adopt these solutions. Do note that with connected home we go beyond Internet of Things devices for consumers, even if used in a home context as you’ll read. All in all, approximately 10 percent of households in the surveyed countries (US, UK and Australia) have connected home solutions. So, we’re still in the stage of the early adoption. An interesting finding from a user/customer perspective for providers of smart home solutions is that a majority of respondents is more in favor of having a single application to integrate their connected home devices. Ease of use, interfaces and a single app do seem logical preferences, certainly if you are one of the few having various connected home solutions such as connected home entertainment systems and connected security alarm systems. In total, 55 percent rated 51 or more toward the preference of one integrating app, Gartner found. A second interesting finding is that consumers also start recognizing the importance of brand certification (58 percent rating 51 or more with regards to certification of – the parts – of the solution by a brand). While these insights might help vendors and providers to enhance the attractiveness of their connected home offerings, Gartner’s Amanda Sabia recommends to push beyond early adopter use and see what motivates those early adopter users to buy more solutions. Gartner’s Jessica Ekholm recommends connected home solution providers to focus on the real value proposition of a full connected home environment, meaning devices, service and experience, with an emphasis on the solving of daily tasks. We’ve indeed seen enough consumer Internet of Things devices (also in a home context) pop up that are not just hard to defend from a value proposition overall and certainly from a more holistic and task solving perspective. Do remember Gartner’s definition of connected home solutions and that, when we talk about the real value proposition of a full connected home environment, that does mean/include the value of integrating devices and of a connected home ecosystem. The US is by far leading in the adoption of connected home solutions. A large majority of respondents is still happy to set temperature and lighting controls manually. And for providers there are monetization challenges in some categories (subscription models aren’t that obvious everywhere). Despite the fact that the real smart home is not there yet, we are using smart home appliances and specific solutions in specific areas. It could be entertainment, home security, smart kitchen appliances (a rather popular segment), anything really. According to a study by the IAB, released end 2016, 47 percent of consumers already have a connected/smart TV and streaming device. Another 39 percent of consumers is interested in buying such a combination. So, that part of the entertainment piece seems to get covered fast. Smart home entertainment systems are also called one of the key ‘practical’ applications, driving the market, along with home safety and anything that saves money. We already mentioned quite some data sources (IDC, Gartner, Beecham Research etc.). Let’s tackle some more that confirms the findings regarding smart home automation dynamics. According to April 2017 findings from Zion Market Research, the global smart home market is expected to reach $53.45 billion by 2022. That’s more cautious than IDC’s forecasts, yet it’s important to look at the definitions as usual. Lighting control, a major home automation area, also in the future. HVAC control, essential in home automation. Among the main drivers we find (just as in commercial and larger buildings) energy efficiency (part consumer awareness and part legislation), an aging population, government initiatives and rising income in developing countries. Light control has the largest market share in smart homes and convenience, comfort and security are other key topics as was to be expected. According to July 2017 research by Transparency Market Research the global market for home automation is expected to rise to a valuation of US$21.6 bn by the end of 2020. Here as well energy efficiency (or energy conservation) is seen as a key focus point, leading to, among others an important role for the comfort and value of HVAC. Top image: Shutterstock – Copyright: ariadna de raadt – All other images are the property of their respective mentioned owners.